Rep. Gabrielle Giffords Pays House Surprise Visit : The Two-Way Even as the vote results came in, the loudest cheers were heard when Rep. Gabrielle Giffords (D-AZ) made her first appearance on the House floor since she was severely wounded by a gunman in January. Rep. Gabrielle Giffords (D-AZ) waves to her House colleagues after voting for a bill to raise the federal debt ceiling, in this image from House Television. The House of Representatives' vote to approve a bill raising the U.S. federal debt ceiling ended weeks of uncertainty and bitter debate. But even as the vote tally came in, the loudest cheers in the chamber were heard when Rep. Gabrielle Giffords (D-AZ) made her first appearance on the House floor since she was severely wounded by a gunman in January. Giffords wore glasses and her hair remains short. 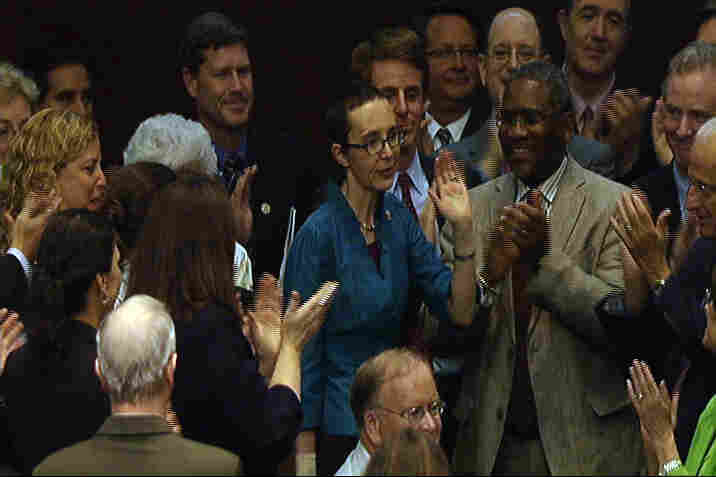 But she stood and acknowledged the loud applause and cheers of her House colleagues, waving to them as a crowd formed around her. During her visit, Giffords also cast a vote, in favor of the debt agreement. Her appearance seemed to catch many House members by surprise; as the vote continued, a note on her Twitter account — which until Monday night had been silent since July 29 — read, "The Capitol looks beautiful and I am honored to be at work tonight." That followed a brief tweet announcing her intention to support the debt bill. Giffords' office released a statement after the vote was over. In it, she said, "I have closely followed the debate over our debt ceiling and have been deeply disappointed at what's going on in Washington." "After weeks of failed debate in Washington, I was pleased to see a solution to this crisis emerge. I strongly believe that crossing the aisle for the good of the American people is more important than party politics. I had to be here for this vote. I could not take the chance that my absence could crash our economy." Her office also noted that Giffords had previously stood against increases to the U.S. debt limit, in 2009 and 2010. The debt ceiling bill now moves to the Senate, which is expected to hold a vote sometime around noon Tuesday. Giffords was shot on Jan. 8 in Tuscon. She was holding a meet-and-greet event at a strip mall. Six people were killed and 13, including the congresswoman, were wounded. Update at 7:40 a.m. ET, Aug. 2. Courtesy of The Associated Press, there's video of Giffords' appearance on the House floor.